The Island of Elba is located off the west coast of Italy in the Tuscan Archipelago, and was first inhabited by Ligures llvati who extensively mined the island due to its valuable iron resources. Like a majority of Europe, Elba was quickly invaded by the Romans around 480 BC, and after their reign ended the island was trampled by barbarians and Saracens. 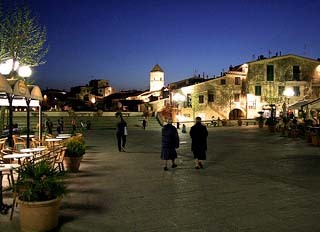 By the 11th century AD Elba was integrated into the Republic of Pisa, and then sold to the Viscoti of Milan in 1398. Shortly thereafter, the Lords of Piombino acquired the island, and controlled it for the next two hundred years. The island of Elba continued to change hands over the next few centuries, as Spain captured Porto Azzurro in 1596 (building two fortresses there) and then the island became a French possession in 1802. It was under France's rule that Elba's economy prospered. This was in part due to Napoleon's exile to the island in 1814, as not only did he quickly grow bored, but he was also genuinely concerned for the citizens. In 1860, after the island was given to the Grand Duchy of Tuscany, Elba became a part of the Kingdom of Italy. 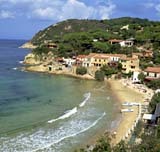 During the mid 20th century, as World War II raged, Elba became occupied by German forces, and wasn't freed until 1944. Today, this beautiful island is a popular tourism destination as it presents an almost perfect climate spring through fall. In addition, Elba is home to a spectacular (volcanic in origin) landscape of steep cliffs, rugged hills, crystal-clear waters, historic castles, quaint little villages and numerous sandy beaches. Not to mention you can also reach the Amalfi Coast from Naples or the Isle of Capri by a dependable ferry service.